City Councilor Nicholas Mavodones present a plan to bond $32 million to renovate two Portland elementary schools and seek state funding for renovations at two others. 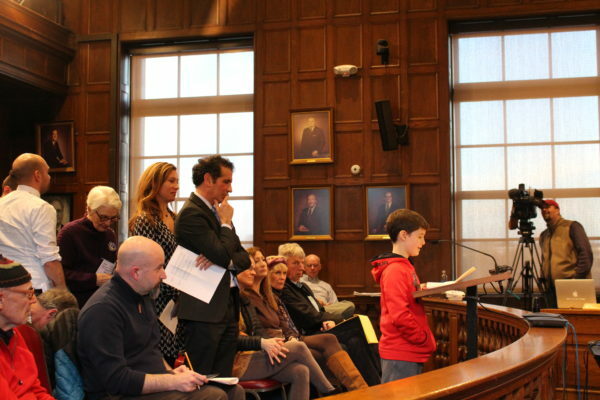 Liam Shay, an 8-year-old Reiche Elementary school student, speaks at a city council meeting Monday in favor of a plan to bond $64 million to renovate his and three other Portland elementary schools as Superintendent Xavier Botana waits in line to testify. 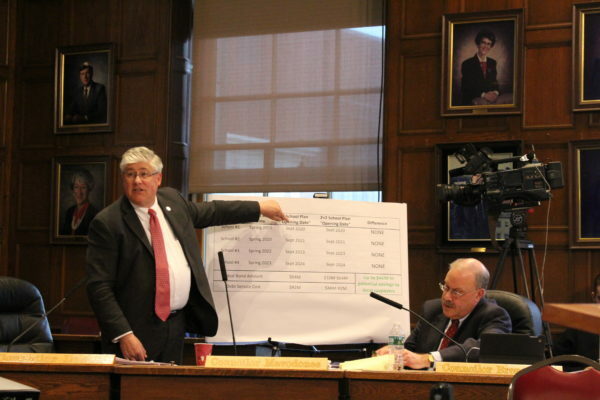 PORTLAND, Maine — Minutes after midnight Tuesday, the City Council came one vote shy of sending a bond to renovate four aging elementary schools to voters as a ballot measure. The no vote, however, does not kill the $64 bond proposal and creates an apparent stalemate on the city council over how to fund renovations at Presumpscot, Longfellow, Reiche and Lyseth elementary schools, despite more than a year of study and apparent consensus among all council members that the upgrades are badly needed. After more than seven hours of discussion and despite the testimony of more than 60 residents, the city council voted three to six against putting a $64 million bond on the June ballot. The measure, which required a supermajority to pass, was defeated by no votes from Councilors Nicholas Mavodones, Jill Duson and Belinda Ray voting against it. Rather than killing the bond proposal outright, under a city council rule the vote creates a recurring cycle in which the $64 million bond motion will keep coming back before the council every meeting until it passes, is abandoned or the council strikes a compromise, according to city lawyer Danielle West-Chuhta. Councilors left city hall Tuesday uncertain of what will happen when the measure comes back up at the March 27 meeting. Their decision was greeted with visible frustration by the more than 40 Portlanders who lingered past midnight to hear the council’s decision on one of the most carefully examined and hotly debated local political questions in recent years. “Let us vote. Let us vote,” some chanted briefly at the end of the meeting. Protect our Neighborhood Schools, a group of parents who are pushing for the bond, will hold a rally at City Hall on Tuesday evening. During the 7½ hour meeting the city council heard the impassioned testimony of Portlanders, who overwhelmingly favored sending the bond to voters. About 60 students, parents, elected officials and other community members spoke in favor the bond, arguing that the investment is needed to improve students’ learning and that the renovations are long overdue. Some wore blue “Rebuild all 4 Schools” stickers in support of the bond and red ones stating “No 2 + IOU” in opposition to an alternative proposal. A handful of people, however, praised the three councilors who forwarded plans to bond smaller sums, saying the tax increase required to pay for the $64 million bond would place a burden on low- and fixed-income Portlanders. Bonding the $64 million in stages over the next six years would, with interest, result in an overall debt of about $92 million, according to city estimates. Over the more than two-decade life of the bond, it and the debt service would add $1,128 in property taxes for each $100,000 of home valuation. For instance, with property taxes forecasted to increase by 3.1 percent over a 26-year period, the owner of a $240,000 home could expect the bond to add an average of $104 to their taxes each year for its duration. While they repeatedly stressed their agreement that significant upgrades are needed, Mavodones, Duson and Ray presented alternative plans to preserve the opportunity to get state funding for work at the schools. A new list of of schools to receive state funding is expected in fall 2018 and Reiche and Longfellow narrowly missed the cut-off during the last round of funding. Ray’s plan would have sent a $24 million bond to voters for major renovations at Lyseth, four new classrooms at Ocean Avenue Elementary and some critical work at other schools. Ray argued the plan would better allow the city to address the facilities needs of all Portland schools, which are forecast to need $321 million over the next two decades. But her detailed presentation failed to win over any other councilors, and the amendment failed one to eight. Mavodones and Duson argued for a “2+2” plan that would ask taxpayers to vote on a $32 million bond to renovate Lyseth and Presumpscot. If Reiche and Longfellow do not get state funding, they would advocate for another bond and said the plan would complete the renovations of all four schools on the same schedule as the $64 million bond. Their amendment was defeated three to six, with the sponsors and Ray voting in favor. Before the final vote Tuesday, Ray and Duson said they want to give Portlanders more than one bond proposal on the ballot. The failure to reach a final decision Tuesday is merely the latest in a long series of delays in addressing facilities needs at the the four elementary schools, which have not had major renovations since they were built 55 to 65 years ago. The present bond debate is the seventh concerted effort since the mid-1990s to improve facilities at Portland’s older elementary schools, according to a school district timeline of facilities work. City Clerk Katherine Jones said the deadline to put a measure on the June ballot is April 5. Correction: A previous version of this story misstated the reason for the bond proposal being continuously returned to the council. It is because of a city council rule.